The National Police Commission (NAPOLCOM) released results of April 2015 Philippine National Police (PNP) Entrance and Promotional Exam in just few weeks after the test. 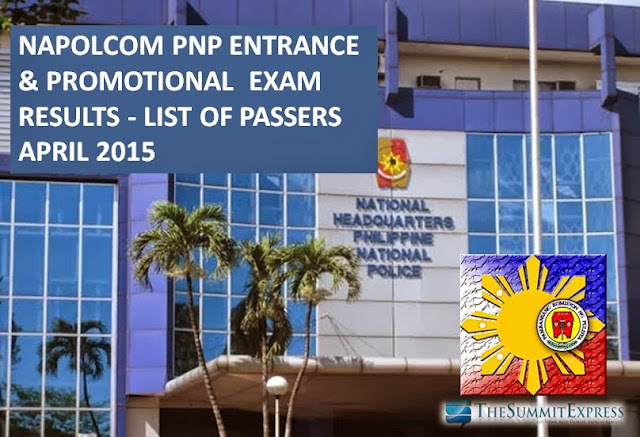 The complete list of passers and Top 20 (topnotchers) for PNP, Superintendent, Police Inspector, Senior Police Officer and Police Officer are available on this page as out online on Tuesday, July 7, 2015. NAPOLCOM administered the PNP entrance and promotional examinations on Sunday, April 26, 2015 to a total of 35,674 examinees in designated testing centers nationwide. A total of 1,343 out of the 13,334 examinees for the PNP entrance exams and 2,719 out of the 22,340 police examinees for promotional tests took the PNP tests in the National Capital Region (NCR) testing centers, namely, Pitogo High School, Benigno Aquino High School and Fort Bonifacio High School, all in Makati City. April 2015 NAPOLCOM exam covered the qualifying tests for Police Officer I and the promotional examinations for Police Officers 2 and 3; Senior Police Officer (for SPO1 to SPO4); Police Inspector (for Inspector and Senior Inspector); and Police Superintendent (for Chief Inspector and Superintendent). The expected release of NAPOLCOM exam results is after 2-3 months or anytime in June to July 2015. June 6, 2015 Update: NAPOLCOM readies website for the upcoming release of April 2015 NAPOLCOM exams. July 7, 2015 Update: April 2015 NAPOLCOM exam results out online! In November 2014 exam, PNP Promotional exam results were officially announced online after 3 months or in February 2015. However, PNP entrance exam list of passers was posted in just 10 working days after the exam in consonance with the Commission’s commitment with the PNP and the Department of Budget and Management (DBM) to make the examination results in synch with the police recruitment process. NAPOLCOM said that 2,052 or 9.70% out of the 21,154 examinees passed the Promotional Examinations while 2,323 or 20.50% out of the 11,332 examinees passed the PNP Entrance Exam. In April 2014 exams, results were posted in less than 2 months after the exam. NAPOLCOM Vice Chairman and Executive Officer Eduardo U. Escueta said that 14,256 took the PNP entrance examination while 21,101 were distributed to the various promotional test categories. Aside from online availability of results, NAPOLCOM will also notify nationwide results via post at the commission's central office located at the DILG-NAPOLCOM Center, located at EDSA corner Quezon Avenue, West Triangle, Quezon City. Regional list will be posted in each of the NAPOLCOM Regional offices also.